Rachael Ray fans, you have a major treat in store for you. 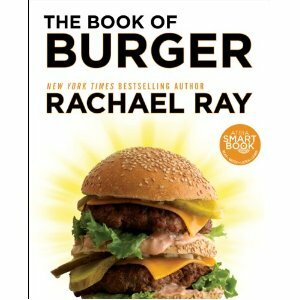 Rachael Ray's new cookbook, The Book of Burger, will hit bookstores tomorrow on Tuesday, June 5. My two word review: love it. I am one of those people who cuts the list of "best burgers" out of my local paper and makes an effort to try them all, so burgers are a subject close to my heart. When I cracked open my copy, I kinda freaked out. So many of them appealed to me that I was completely overwhelmed. My picky eating habits are well documented in this space, so a compliment like that from me is high praise. The pictures really don't do them justice, but I can tell you with certainty that both were outstanding. 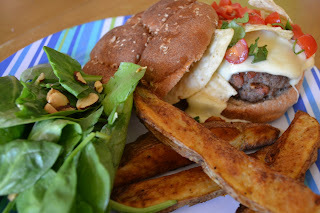 In my defense, it's hard to take pictures with a one year old who likes to stand up in his high chair and throw things at his big sister.... Take note that these aren't quicky burgers that you whip up in a minute, but I think they are, without question, worth the time and effort. In addition to more beef burger recipes than you can throw a stick at, you'll find recipes for pork burgers, chicken and turkey burgers, lamb burgers, veggie burgers, and seafood burgers. 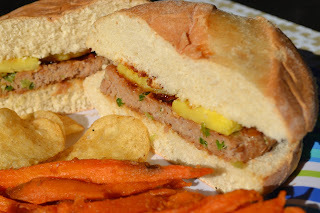 There are also sliders, sandwiches and dogs, sloppies, sides (I've got my eye on you, Homemade Tots) and sauces, and recipes from the Burger Bash that Rachael Ray hosts each year. When I first heard that Rachael was doing an "all burgers" book, I was pretty skeptical. However, after taking a close look at the book, I think it is much more than that. Yes, there are a million burger recipes, but these are not your average burgers - some are fun, some are out there, and some are about as gourmet as a burger can get. As a disclaimer, not every recipe in here is new and many of them are available online. However, that can be said for almost all of Rachael's recipes. She doesn't publish them online then yank them a few months later. I still love to buy the cookbooks. Maybe I'm old school, but I love seeing the recipes all in one place, looking at the photography, and flipping through the recipes to plan a weekly menu. There are also lots of cool "smart" features to this book that make it interactive. So go out tomorrow, get your copy of The Book of Burger, and report back on your favorite burger! It really is great. I still have to make the tots!!! The Beef n Bean one was good for a change, but I wouldn't make it again.